Clovis Crawfish and his friends share two adventures on this English/French bilingual audio track. Friendship is the underlying subject in the very first volume in the landmark Clovis Crawfish Series. And, it’s springtime in south Louisiana, or is it? Henri Hibou (Henry Owl), warns Clovis that it is not yet spring. But when he sees Simeon Suce-Fleur lying on the ground, shivering from the cold, has Clovis arrived in time to save the little hummingbird? Side 1 presents Clovis Crawfish and His Friends, the now-classic book that launched this popular series. Clovis lives in a mud house in Bayou Frog Tail-which strikes Clovis as a strange name, since frogs don't even have tails. Bertile Butterfly is no help in explaining this mystery to Clovis. On side 2’s adventure, Clovis Crawfish and Simeon Suce-Fleur, the sky darkens and strange cold flakes begin to fall. Clovis hurries back to his mud house for shelter, only to find his new hummingbird friend Simeon Suce-Fleur suffering badly from the sudden icy weather. Clovis must rally his neighbors to save Simeon. Audiocassette. Clovis Crawfish and all his friends return in a new bayou tale. Michelle Mantis, an ugly old insect with an enormous appetite, visits the swamp home of Clovis and his friends. Her voracious appetite alarms Clovis’s friends, as Michelle eats and eats until she can scarcely move. But when Michelle tumbles into the mud, Clovis must rally the other swamp creatures to help. Clovis Crawfish and all his friends return in a new bayou tale. Michelle Mantis, an ugly old insect with an enormous appetite, visits the swamp home of Clovis and his friends. Etienne Escargot makes his way through the bayou country to live with Clovis and the bayou friends. Michelle Mantis visits Clovis and his friends and she alarms them with her voracious appetite, but when she tumbles into the mud, Clovis must rally the other swamp creatures to help. When the rain begins to fall, trapping Etienne and his eggs. Clovis and his bayou friends enlist the carving talent of a friendly woodpecker to construct a pirogue out of a cypress tree limb, to guide them to safety. As the group of bayou animals hurry to see the baby blue jay who has fallen from his nest during a storm, everyone wonders what to do next in Clovis Crawfish and the Orphan Zo-Zo. Clovis Crawfish, whose adventures have delighted children since 1961, is back again. In this story, now in full color for the first time, the fascinating phenomenon of metamorphosis unfolds to delight young readers. As the sun is setting on the bayou, a new friend makes her way to Clovis’s mud house. Silvie Sulphur (a member of the butterfly family) is looking for a new home. She encounters a warm welcome among Clovis and his friends and soon finds the perfect dwelling. Hardcover. When a big betail (big animal) intrudes into the swampland on a gloomy day, the bayou critters are fearful. The big betail is Andrew Armadillo from Texas. A huge creature with a hard shell, cowboy boots, and thick-lensed spectacles, Andrew at first frightens our bayou friends with his strange accent and booming voice. Clovis Crawfish and his friends share two adventures on this bilingual CD. Tracks include French and English translations. A big bétail (big animal) intrudes into the swampland on a gloomy day, and the bayou critters are fearful. Can Clovis help them to overcome their fears? A group of bayou animals hurries to see the baby blue jay that has fallen from his nest during a storm. Some of them, like Christophe Cricket and Gaston Grasshopper, feel that the bird should be left alone as it could later pose a threat to them. Yet Clovis knows that the orphaned bird needs their help badly, and they cannot let it die. Clovis Crawfish and his friends share two adventures on this bilingual audio. Tracks include French and English translations. A big bétail (big animal) intrudes into the swampland and the bayou critters are fearful. Can Clovis help them to overcome their fears? A group of bayou animals hurries to see the baby blue jay that has fallen from his nest during a storm. Some of them, like Christophe Cricket and Gaston Grasshopper, feel the bird should be left alone as it could later pose a threat to them. Yet Clovis knows that the orphaned bird needs their help badly, and they cannot let it die. In this adventure, nature plays its mysterious games and Clovis and his friends learn to appreciate it and each other a little better. Corinne Crapaud is Fernand Frog’s shy cousin. She can only say a few words, and they’re all question words. “Qui?” (Who? ), “Quoi?” (What? ), and “Pourquoi?” (Why?) are three of her favorites. Clovis and his friends help the Cigales twins, Chicot and Coteau, stage a summer concert on the bayou despite the ever-present threat of the voracious M’sieu Blue Jay. Children will learn ecology as well as French in this adventure. 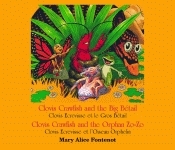 Clovis Crawfish and his friends are for two new adventures on this English/French bilingual CD. Clovis and his friends help the Cigales twins, Chicot and Coteau, stage a summer concert on the bayou despite the ever-present threat of the voracious M’sieu Blue Jay. Bertile Butterfly has a baby, and Clovis and his friends are surprised to see that the baby does not look like a butterfly. It looks like a worm instead! As they watch the baby grow, they discover the growth stages of a caterpillar. 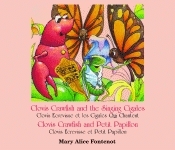 Clovis and the gang help the Cigales twins, Chicot and Coteau, stage a summer concert on the bayou, and when Bertile Butterfly has a baby, Clovis and his friends discover the growth stages of a caterpillar. Clovis Crawfish and his pals return in another adventure on the Louisiana bayou. In Clovis Crawfish and the Spinning Spider, Simone Spider threatens the peaceful region by building her silver web right by Clovis’s mud house. The bayou friends watch helplessly as Simone puts the finishing touches on her sticky web.